This is my kind of meal! 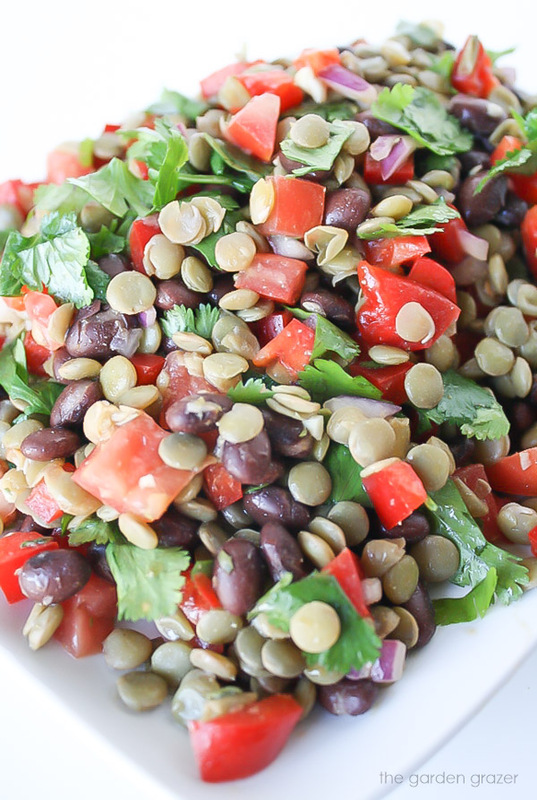 Hearty black beans and lentils mixed with cilantro, veggies, and a flavorful cumin-lime dressing. As soon as I saw the recipe on Kalyn’s Kitchen, I knew I had to try my own version. I’ve made numerous recipes from Kalyn’s site and have never been disappointed! This salad was certainly no exception – it became an instant favorite. It’s so simple to make, and is a perfect cold lunch to bring along for work or picnics, gatherings, and BBQ’s. Thanks for the wonderful inspiration Kalyn! 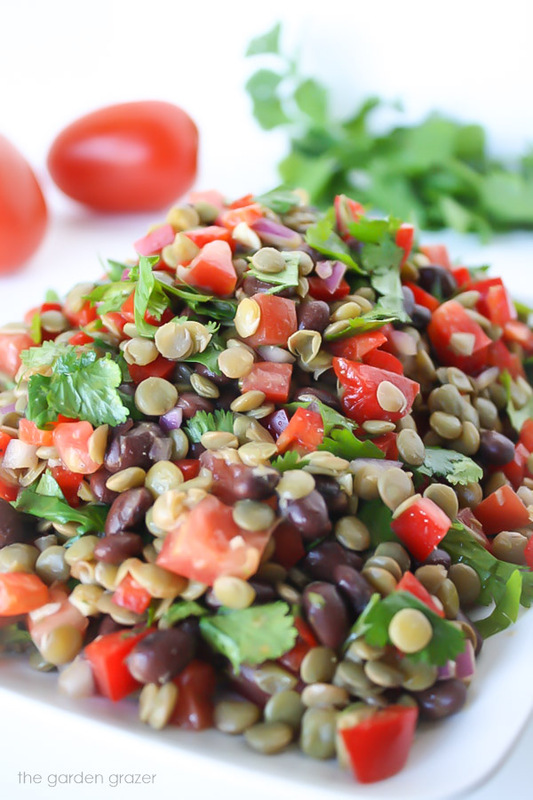 PS – if you dig the black bean/lentil combo, try these delicious Black Bean Lentil Tacos too! Optional: chipotle powder, chili powder, pepper, hot sauce, other seasonings, etc. Finely dice the bell pepper, onion, and tomatoes. Roughly chop the cilantro. 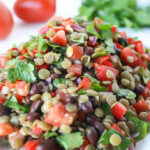 In a large bowl, place the black beans (rinsed and drained), bell pepper, onion, tomatoes, and lentils. Add the dressing and toss to combine. Add cilantro, and lightly toss. Serve immediately or chill covered in the fridge for at least an hour to let the flavors combine. Your salad looks fantastic, so glad you enjoyed it! Oh this is my kind of salad! something hardy, fresh, and delicious! I love the look of this salad! 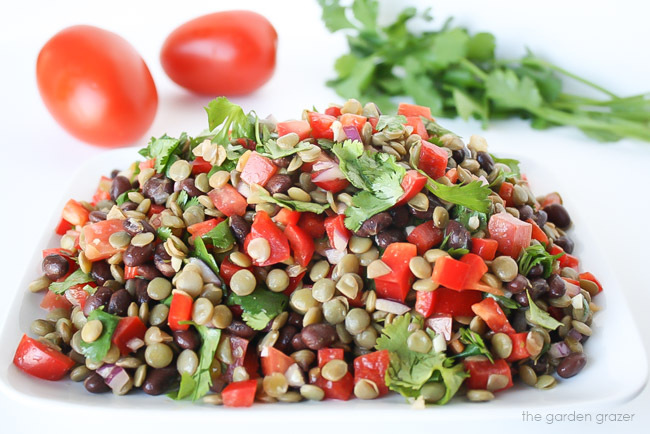 Adding the grains/legumes is totally the way to go for salads that function as a meal. Add in cumin and lime? I'm sold! I made this for our dinner today. It was great on a bed of chopped Romaine along with a papadam. Thanks for the recipe!! Nom nom nom. Oh that sounds fantastic! I've never tried it with romaine before – thanks for the great idea! So glad you enjoyed it!! Hi again Melissa! Thanks for your sweet comment and for sharing the recipe. Definitely a lover of salads, can't get enough! 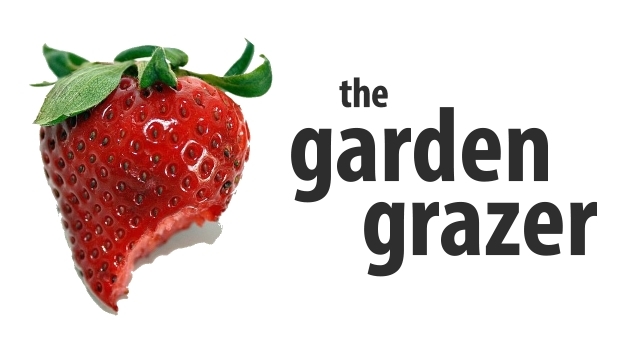 You have tons of awesome ones on your site as well – yum!!! 🙂 Thanks for stopping by! This is sitting in my fridge right now and I keep getting a spoon out and "taste testing". I am trying to save it for tomorrow, but it's not working. Haha – I know exactly what you mean! You want to sneak just one bite, but a couple minutes later you're taking it back out for more. And more… and more 😉 Glad you're enjoying it!! Now this salad looks awesome! Funny that many people think it's difficult to get enough protein on a vegan diet. For men the protein question occurs probably even more than for women. I'll definitely recommend them your blog next time. Could you freeze this salad (without dressing)? About how many servings does this make if you were to make this as a main dish? Hi Lauren! I'd estimate about 4-5 servings as a main dish 🙂 Hope you enjoy! Aww, thanks so much for your kind words Mary! It truly makes my day to hear people enjoying the site 🙂 Wishing you a lovely weekend! How long will it keep in the fridge after adding the dressing? Yes Ma'am! I ate it several different ways. I put sautéed shrimp on top as a cool salad dinner. I even rolled some in a tortilla with shredded roast chicken. I will make again and again. Lasted 3-4 days as you said . This is a very tasty recipe. This is a great side dish, we also enjoyed it as a snack with tortilla chips, so yummy. Thank you. Aww, yay so glad you enjoyed it! I agree – it makes a great chip dip as well!! 😀 Thanks for coming back to leave a message. Happy Friday! Just stumbled across this, looks yummy! I am allergic to bell pepper, so I was wondering what vegetable you might suggest as a replacement? Fantastic!! I mixed some spinach leaves and mushrooms in the salad, too and everything was great! Thank you! Hey Barbara! YAY! Happy to hear you enjoyed it 🙂 Great call adding mushrooms and spinach, a couple of my favorites!! Will have to try that next time. Thanks for coming back to leave a comment – have a lovely rest of the week!! Roughly how many does this recipe serve?